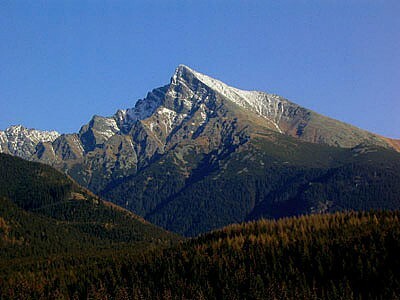 Kriváň (word comes from an adjective krivý - crooked) is the Slovak national mountain rising up to a height of 2494 m above sea level in the High Tatras. Slovaks consider it to be the most beautiful peak of the Carpathians. Kriváň has become a place of "National Gatherings" - patriotic meetings of people of culture, nationalists, and politicians. Thus Kriváň as a symbol of Slovak freedom and independence became a popular motif of past and contemporary artists. The image of Kriváň could be found also on Slovak coins 20 halierov [SKK]. The Kremnica Mint was established in 1328 and is one of the longest continuously operating manufacturing plants in the world.